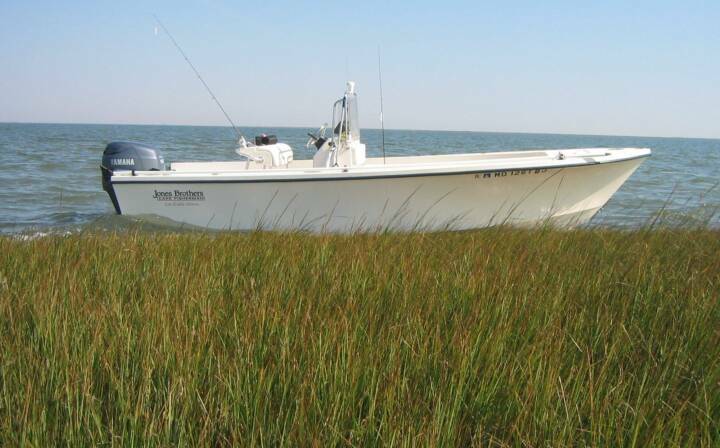 You will be fishing from a Jones Brothers Cape Fisherman 20, a boat made famous because of it's popularity with East Coast fly fishing guides. Powered by a Yamaha F150 four-stroke, this rig offers a safe, smooth, dry ride, with ample rod and tackle storage - all Jones Brothers trademarks. Add to that a clean, flat, clutter-free deck, and you have a safe and enjoyable fishing platform. Modern electronics by Lowrance will keep the day worry free, so you can concentrate on the fishing. USCG approved life jackets and safety equipment are on board and readily available. Capt. Kevin Josenhans is a SAGE Elite Pro, so you will be fishing with the highest quality and sweetest casting fly rods on the planet. Best of all, SAGE rods are hand-crafted right here in the good old USA. Fly lines by RIO give even the novice caster an edge in reaching out to their maximum potential. Kevin's custom-tied saltwater flies are available for your use. Feel free to bring your favorite rod and tackle, especially your own flies. Kevin is always open to learning a new tying technique from his clients. Light tackle spin and bait-casting anglers are welcome and encouraged to spend a day on the bay with Captain Josenhans. For your enjoyment, we carry quality G.Loomis spinning rods and Shimano reels. Spooled with PowerPro braid you will experience long casts and a sensitive feel, so the 'big one' doesn't get away. All spinning lures and bait (if needed) will be provided. Super-insulated YETI coolers are on board, filled with ice for your lunch, and any fish you would like to take home for dinner. All in all, you can pretty much just walk on board and go fishing.